For dog lovers, it's an absolute: The unconditional love of a canine companion heals the soul, reaching into the heart to cross canyons of loneliness and despair. Military researchers now are trying to learn if there's real science behind that semimystical link — and if so, whether it can help treat the signature wounds of the Iraq and Afghanistan wars. A $5 million study is underway at the Walter Reed National Military Medical Center in Bethesda, Md., to evaluate whether and how training service dogs may help patients with traumatic brain injury or post-traumatic stress disorder. Participating troops are paired with puppies that they will raise for two years to serve as assistance dogs for other injured veterans. WASHINGTON — President Obama's announcement that he's sending military advisers to Iraq raises questions — in some quarters, red flags — about whether that could mean a return to warfare under another name. Obama says flatly: "American combat troops are not going to be fighting in Iraq again." Yet the mission as he's defined it — sending up to 300 military advisers "to assess how we can best train, advise and support Iraqi security forces" — is open-ended enough to chance putting at least a limited number of Americans back into the thick of battle. Modern American history has examples of military advisers limiting themselves to just that job, such as times during the Cold War when the U.S. helped arm and train military forces in developing countries aligned with Washington. It also has examples of mission creep, most infamously in Vietnam. 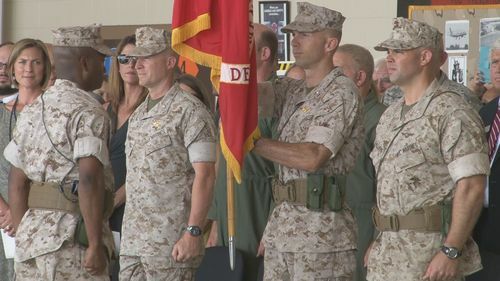 A new Marine commander has been named at Robins Air Force Base. After two years of service, Lt. Col. David Steele relinquished command to Lt. Col. Philip Eilertson. Eilertson will have about 160 active duty Marines and 150 reservists under his authority. Aircraft wise, he has a total of 5 helicopters and is hoping to have a total of 8 before the year is over. He says in order to keep the branch successful, both sides must work together. Veterans of the Iraq War and their families are watching with dismay and alarm as Sunni insurgents overrun large swaths of Iraq, including cities like Mosul, where hundreds of U.S. troops died. "I completely disagreed with the decision to walk away from Iraq," said former Army Sgt. Kenneth Mancanares. "Now, to be honest, I'm trying to think if there's even a way I could get back out there. I'm sure there are a lot of guys feeling that way. I really wish that I could sign up on something tomorrow and join a volunteer group that's going there to stand up for these people."